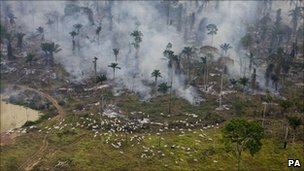 The BBC is reporting that deforestation in the Amazon has risen sharply over the past month. Brazilian Environment Minister Izabella Teixeira said the figures were “alarming” and announced the setting up of a “crisis cabinet” in response to the news. “the latest data shows a 27% jump in deforestation from August 2010 to April 2011. The biggest rise was in Mato Grosso, which produces more than a quarter of Brazil’s soybean harvest. Some environmentalists argue that rising demand for soy and cattle is prompting farmers to clear more of their land. But others see a direct link between the jump in deforestation and months of debate over easing an existing law on forest protection. “You have 300-400 lawmakers here in Brasilia sending the message that profiting from deforestation will be amnestied, that crime pays,” Marcio Astrini from Greenpeace told Reuters. It is estimated that one in ten known species in the world lives in the Amazon Rainforest. This constitutes the largest collection of living plants and animal species on Earth.